Skip tracing is part science, part art. Knowing how to get started, having a clear strategy, and understanding basic techniques can help you become a better skip tracer. 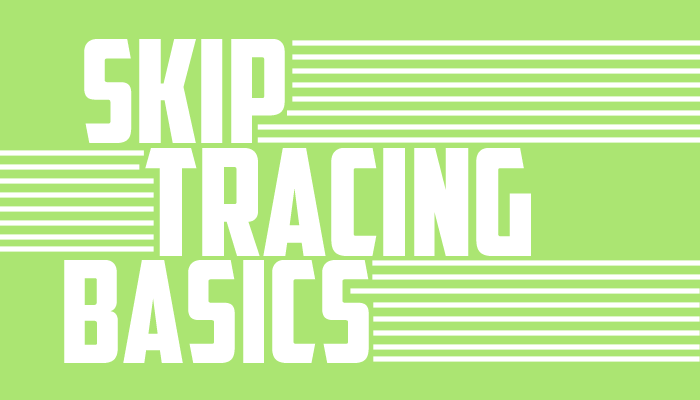 Below we walk through the rules to skip by, skip tracing strategy basics, and more. Keep reading to learn about the starting point, common mistakes, data manipulation basics, and the importance of verifying data. Make sure that you know whether a street name is two words or one word, whether you've been given a nickname or shortened name, and that you know how accurate the information you've been given is. The starting point is your personal identifiers: full name, age, gender, date of birth, SSN, last known address. Collect all of the information you can, but don’t oversaturate your search with all of your data. Adding too many fields will narrow your search, and if they’ve recently changed their address or cell phone that individual won’t show up in your search. A proximity identifier would be a family member, vehicle information, city and state of residence, court proceeding, email address, and voter registration. Proximity identifiers can be tricky (divorce, selling their car, etc.) and can also bring an overwhelming amount of potential subjects. Uncommon last names can sometimes be run against the city or zip code to hopefully return accurate results. The biggest mistake a skip tracer can make is trusting that the information they were provided is totally accurate. Don’t make assumptions! Verify the data provided, and make sure that any garbage that comes in gets tossed out. Use the least information possible to find the most accurate data. The most common mistake made by new skip tracers is inputting too much information. The database will give you different results with different search criteria. By starting broad and narrowing down the information step-by-step, you have a better chance of finding new information on your subject. Input as little data as possible. It’s not about the mountain of data that we have, but identifying specific aspects and narrowing it down. Locating the wrong information helps no one. Make sure you are verifying your results, and disclose and discard carefully. Understand that there is no shame in starting over. It takes time to hone your strategy and learn what works best. This is a basic overview of skip tracing. If you have tips that you would like to add, please comment below.